If you are a water-sports accident victim, call this West Palm Beach Parasailing Accident Lawyer today. Parasailing is a fun activity. Tourists and locals alike enjoy parasailing every day in Florida. However, if not done correctly, parasailing can be quite hazardous. Parasailers are typically towed behind a boat. They hang from a parachute that is pulled by a rope attached to the boat. This activity typically is done at the beach or other body of water. Either one or multiple people may parachute at the same time. 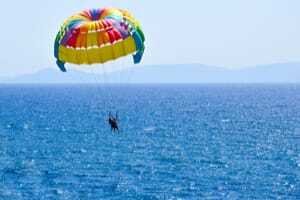 Parasailing accidents frequently occurs when occupants fall out of the sky. They may crash to the water and sustain catastrophic injuries or even death. Such bad injuries occur because, when a fall occurs from a great height, water can feel as hard as concrete. It used to be that the parasailing industry was largely unregulated. There was no law that parasail operators had to carry insurance, and so many didn’t. When customers were injured, there was therefore no way for them to obtain compensation for their injuries. However, this has now largely changed. This is due to the fact that legislation has been passed in the State Legislature in Tallahassee to ensure that all parasail operators carry insurance. If you’ve been the victim of a water-sports accident, call this Florida Parasailing Accident Law Firm. Mr. Quackenbush will discuss your case for free. He can help you if you’ve been hurt in Miami, Miami-Dade County, Fort Lauderdale, and Broward County. Many things can cause a parasailing accident. These include bad weather. While parasail operators are supposed to cease operating in bad weather, many don’t do this. Heavy winds can thus cause parachutes to be blown over and participants to crash to the water, thus sustaining serious injuries or even death. If you’ve been hurt in a parasailing accident caused by defective equipment, you may be able to pursue a case against the parasail-operator as well as the manufacturer of the defective equipment. This second case would be referred to as a products liability case. In the products liability case, you would need to prove that the defective equipment was in the same condition as it was at the time it left the manufacturer’s hands. After all, if the parasail operator did something him or herself to make the equipment defective, then there would be no way that the manufacturer of the product could be responsible. In that case, it would be the parasail-operator who would be liable for creating the defect. Drowning is unfortunately a frequent result of parasailing accidents. This occurs many times when a participant isn’t able to get out of his or her harness once in the water. Harnesses should be easy to get out of, but this isn’t always the case. Many different types of injuries can result from a parasailing accident. These include broken/fractured bones, brain injuries and even death. If your loved one has passed away as a result of a tragic parasailing accident, then you may be able to pursue a wrongful death case on your loved one’s behalf. In that case, you or another loved one will be appointed as the “personal representative of the estate” (“PR”), and that person will pursue the case on behalf of your loved one. Any money earned from the case will go to your loved one’s survivors/the “beneficiaries of the estate”. The statute of limitations for a typical parasailing accident case is four-years. This means that you have four years to pursue a parasailing accident case after an accident. However, the statute of limitations for a wrongful death case is only two-years – so don’t delay filing a lawsuit if your loved one has tragically died in a parasailing accident due to somebody else’s negligence. Should you or a loved one be injured in a parasailing accident in Palm Beach County (including Belle Glade, Boca Raton, Boynton Beach, Delray Beach, Greenacres, Jupiter, Lake Worth, Lantana, North Palm Beach, Palm Beach Gardens, Palm Springs, Riviera Beach, Royal Palm Beach and Wellington), call Mr. Quackenbush at 954-448-7288 to discuss your case at no charge.